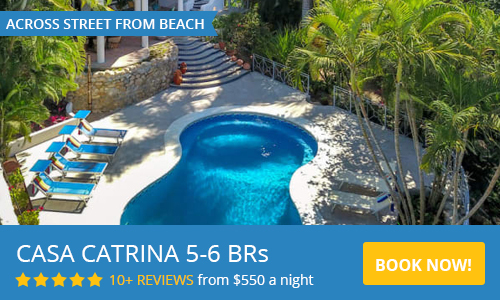 Casa Parota Boutique Hotel in Sayulita is in a great location. With 4 Rooms and 4 Baths, this boutique hotel has rooms that can accommodate from two to five guests, and is perfect for a large family or a group of friends traveling together for a surf or shopping getaway. Perfectly located close to town yet away from the nightlife of centro. There is an art gallery and Organic cafe downstairs, the Farmer's Market is just a few doors down, and it is less than a five minute walk to the plaza and the beach. There is a terrace off the Deluxe Family Room that is perfect for watching parades and you have a great view of the indigenous artisan vendors up the street. You will not need a car or a golf cart from this great locale. Beautifully appointed with beautiful artwork and Mexican colors, Casa Parota Boutique Hotel offers soaring ceilings and strategically placed windows to catch the ocean breeze, ceiling fans in the living spaces and air conditioning in all 4 rooms. - Washer and dryer in a spacious laundry room that offers plenty of room to store your surfboards in a secure location. - Spacious lounging and dining areas are shared by guests and are beautifully appointed and comfortable. Flat screen smart TV with satellite, telephone, and premium, high speed WiFi are included for those who wish to stay connected while on vacation. - In room breakfast, packed lunches, and room service available. There are 4 rooms, all with air conditioning. Please view the Pricing details tab for room rates. - Deluxe Master Suite w/ PrivateTerrace has a King size bed, large private terrace, and ensuite bath. Accommodates 2 guests. - Deluxe Family Suite has one King and one Queen bed, ensuite bath. Accommodates 4 guests. - Extra Large Family Suite has one King, one Queen and one Individual bed, ensuite bath. Accommodates 5 guests. This room has a small terrace facing the street which is great for watching parades! Please use the contact form to get in touch with any questions and to book your stay. We look forward to welcoming you to Casa Parota Boutique Hotel in Sayulita. Amazing house/hotel with an enormous room and bathroom. Although the house was shared with others, we almost always had the common spaces to ourselves. Beautiful decoration. We loved the fully equipped kitchen, probably the best one we've ever had while traveling. It really felt like a home away from home, and the daily cleaning made it even better. Wifi was also perfect. Location and style were good. Since it's more like a flat, the kitchen and living room were shared; kitchen equipment was useful and clean. Security doors are good. It was beautiful and really comfortable. It was just off the main center. Very convenient. Very comfortable, beautifully decorated spacious room. Excellent well-appointed communal kitchen w/ good appliances, good security as rooms have combination #s for entry, no keys. the house is beautiful! the rooms are very big and well decorated. the beds and showers are great. The room was gorgeous. The bed was comfy and the pillows were the best pillows I've ever used! The room was very large with a comfortable temperature. We accept Paypal, and live in Mexico so have a Mexican bank account for transfers. We require a 50% deposit and you are welcome to pay the balance in cash if you wish. If you have any questions regarding payment methods, don't hesitate to ask.